The PhD Chronicles: Acceptance...and acceptance. By the time you read this, I'll have been in a PhD program for a year--so my "Acceptance" into a program isn't new by anyone's reckoning. I'm publishing this a year later as I feel it will be an interesting experience to be reminded of my initial experiences well after they have been formed. I think also as I begin to reflect on finishing my first year, it will give me some thoughts to see what my initial experience was. 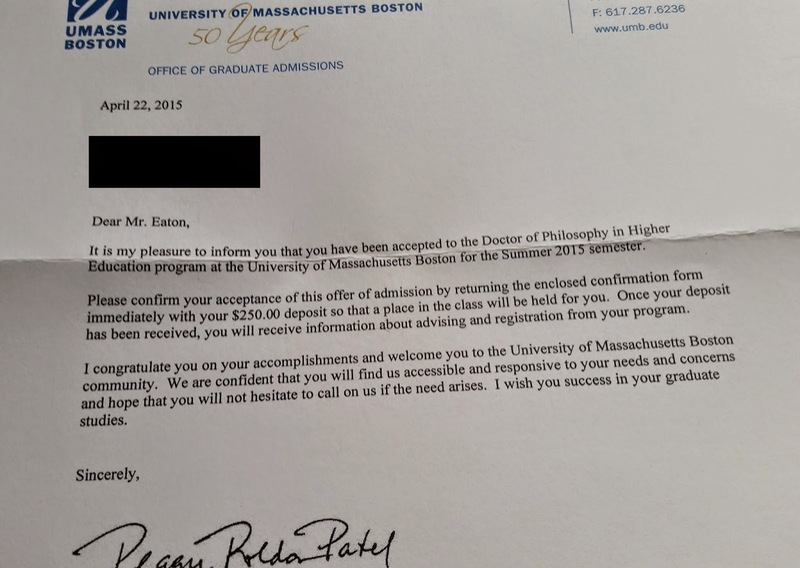 I am glad that I have been accepted into the University of Massachusetts, Boston, PhD in Higher Education program. I feel like it is the next step in my own development and understanding about higher education. After all, I have spent 17 of the last 18 years in higher education either as a student, an instructor, or a professional staff member (or some form of up-to all 3 at times). However, I found this start a bit bumpy and problematic for a program that is supposed to be about "Higher Education." The initial application process appeared straightforward. Yet I still encountered a few small issues that entailed me to contact the email that was listed on this page. Sometimes, they were answered and sometimes they weren't. Of the six emails I sent over six months from the beginning of the application until the finish, I got two replies. I got my ducks in a row and applied. The deadline was February 1st but I made sure to have all my documents in by early January. I received a Doodle poll email on February 23rd for an interview in early March. I interviewed on Friday, March 6 and was told that I would be informed in early April about a decision. They explained that things were delayed because of the snowstorms that hit New England that February. Early April came and I began checking the mailbox every day. We passed April 10, which to me means it is no longer "early April." On April 15th, I receive an email from the director, who said he wanted to talk on the phone and answer any questions that I might have and discuss next steps. Interesting, but vague. I replied to inquire if I had been accepted into the program as I hadn't received written confirmation yet. (One of those emails to the Contact Us was about how I had changed my address in the interim between applying and interviewing). He said that my application was still under review. It sounds strange and I wasn't the only one applying to this program that felt this way. I went ahead with the phone call two days later where he did inform me that they were recommending me for the program, but that it would be Graduate Admissions that makes the final decision and sends out the acceptance letters. I was happy but without the actual confirmation, it still left me leery. I informed him of the address change and emailed him right after the phone conversation thanking him and updating the address. He told me that I should see the letter by April 27. It showed up on April 29th. It was delayed because it was sent to my old address. Much of this has been a somewhat disappointing introduction to the program. This is a program about the very institution that creates the program--it's meta in many ways and thus far, it reminds me of my experience with my Instructional Design degree. It doesn't demonstrate what it preaches. The first issue is the failure of email responses. Missing one I can understand but four out of six seems problematic. The second issue is the delay. I got actual confirmation for the program on April 29 for a program that I had to commit to for the first three weeks in June. There's a lot of planning and work that needs to be done to prepare for the program and to prepare for the absence from work. Added to this is that with each day that passes, my belief that I would be accepted wavered. The final issue was the address on my acceptance letter. What was the point of sending the updated address to the director? That was sent on April 17--5 days before the acceptance letter was printed. In the big picture, these are small issues but they are enough to make me a bit more skeptical about the program. I am excited about the program for lots of reasons but these small indications of a program that can't do what it's supposed to do best does set off the spidey-sense.